As pretty as the blue yarn was, it seemed rather silly to swatch in a completely different yarn. So I discarded it, changed needle sizes, grabbed some beads and grabbed the red wool/silk blend. I’m using size 11 Miyuki Delica beads. They’re a little smaller than what is called for in the pattern, but for me, I don’t want the beads to overpower the effect. I want to have a beaded lace shawl, not a lacey beaded shawl. 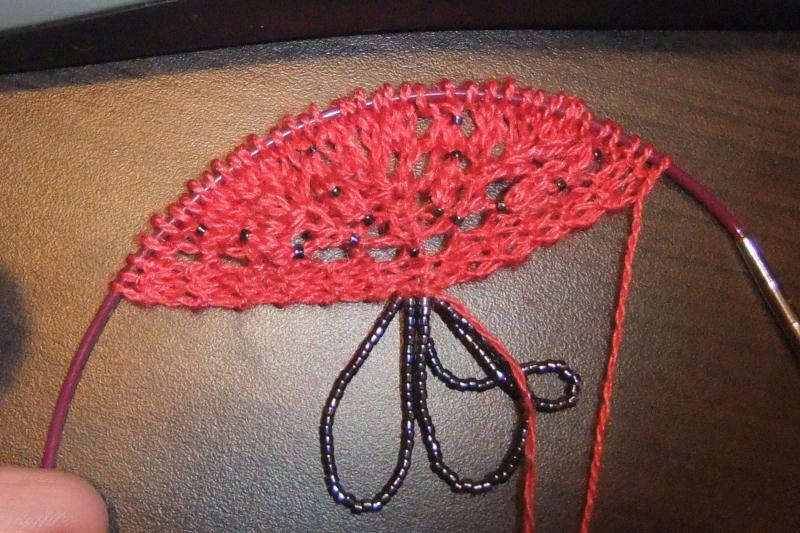 For the full size shawl, I actually have deep red translucent seed beads (size 11/0), so it will be very subtle. This Swatching Thing is Slow Going. OMG My Boy Can Knit!